I think there is a mix of reasons behind why a lot of people haven’t clicked this option. I am here to tell you that this is an amazing feature to understand what your dashboards are doing behind the scenes and how you can utilize the information captured by “performance recording” to ensure that you create dashboards that truly provide rapid-fire business intelligenceyou promised. Let’s address the first reason, if you are worried about what might happen when you click this option, don’t be. This includes connecting to a data source, executing queries when you filter, navigate, etc. The details on all of these interactions and the duration are being captured in tab delimited file on your local machine. After click on “Start Performance Recording”, just go ahead and interact with the dashboard as you typically might. Or your end user might. Or randomly click and filter for various options, whatever you fancy. Now, at this point, just be patient for a few seconds. 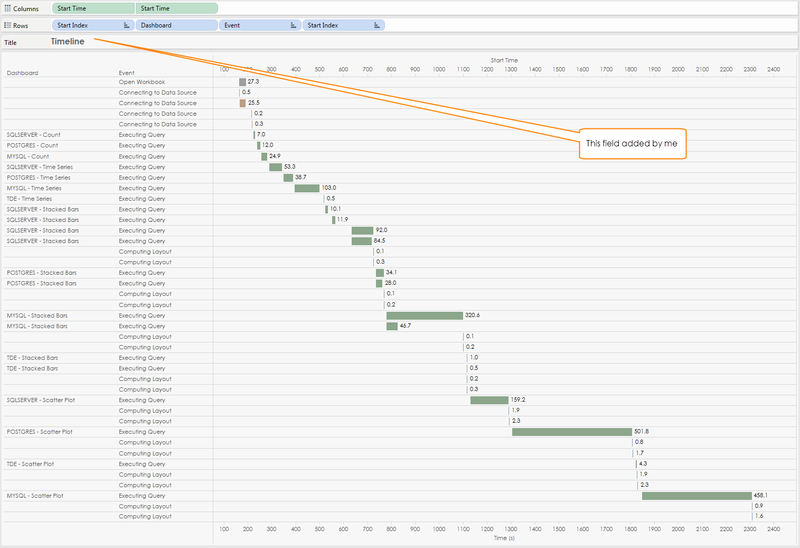 Tableau Desktop is going to instantiate another window and open a dashboard that connects to the data you just captured, and show you some very useful analytics about your interactions. If you have recently read my other article Tableau Data Extracts, I used performance recording to capture the stats for that article. The idea here is to show the slowest running queries at the top. 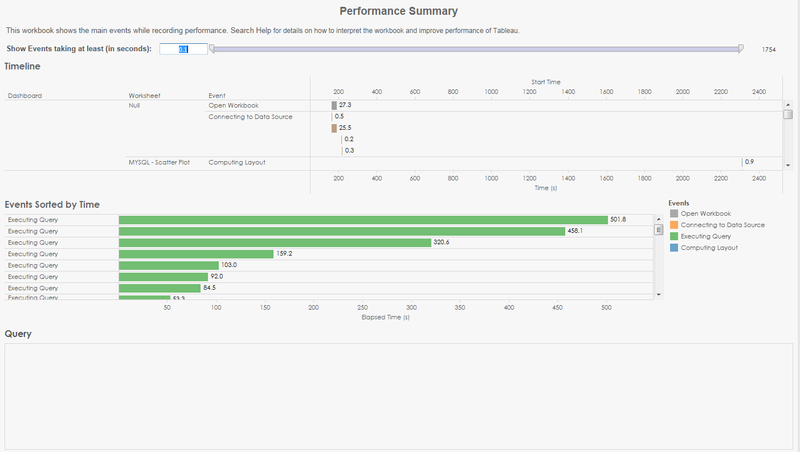 Now, I can see the results of the queries in the same order as I was interacting with the dashboard. Much more useful, eh? Hope this help. I must say, everyone who has clicked on this option, has always gone back to this feature to do the analysis of their dashboard performance. You gotta try it… don’t be fearful. Tableau isn’t writing any of these stats to the database. Quite frankly, there is no additional load to your database, just a bit of extra load on your machine where you have Tableau Desktop. 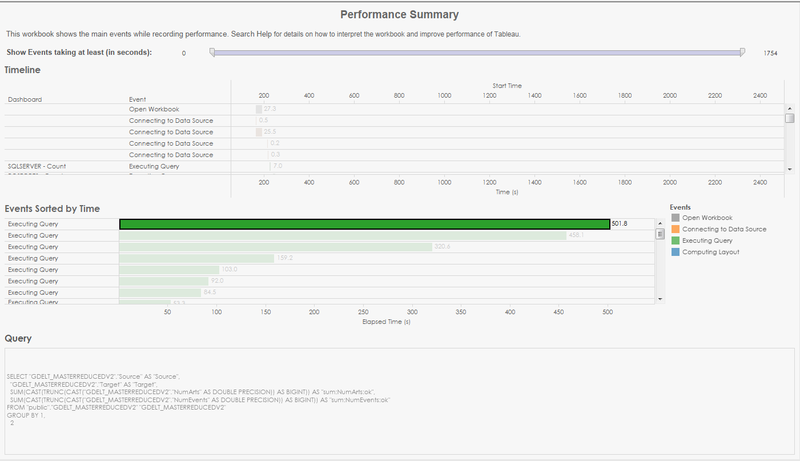 Now, regarding the second reason, I think it would be great for Tableau Desktop to add some sort of indicator so the user knows that Tableau is recording the performance stats. Better yet, open the performance workbook and show real-time streaming data from the performance stats file as you click on the dashboard. Wouldn’t that be something? Next Data Viz 0r Eye Candy?